I had great hopes for Sling TV, but that was then. Sling TV is just not a great option for cord-cutters; In fact, it’s starting to look like the rest of the cords. Everyone is excited about Sling TV. Is it truly a game-changer? After a careful look, I’m just not impressed. Let’s start with one simple fact: Sling TV is a subsidiary of Dish Network. This places Sling TV in the position of an alternate revenue stream for yet another big media corporation. This is hardly the environment for television anarchy and “death to cable”. They may have the experience to leverage their expertise and make deals with media partners, but let’s face it: When your parent company is a satellite provider, no one here is actually, as their slogan suggests, “Taking Back TV”. Orange Level – the original channels that you know and love (28 channels). Blue Level – a new tier that gives you access to channels owned by NBC and Fox (43 channels). Orange + Blue – everything from the first two tiers as a total package (46 channels). If you’re quick, you may have noticed something – my math looks bad. Orange has 28 channels, Blue has 43 – why doesn’t Orange + Blue equal 71? 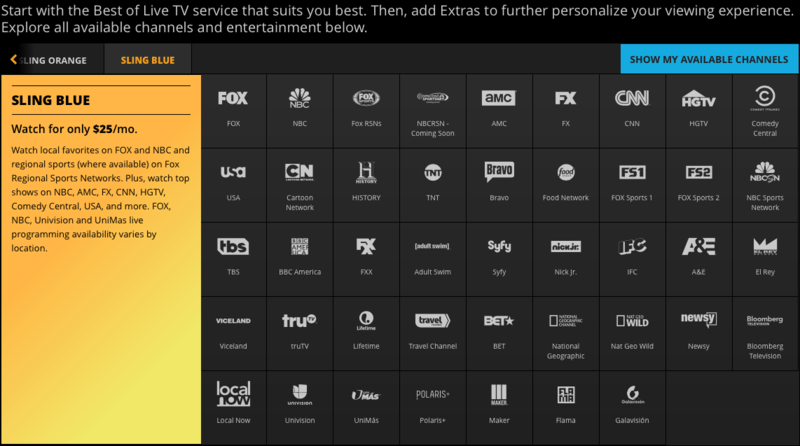 Sling TV touts Orange + Blue as the “best value.” But is it? No. Not by a long shot. It’s totally misleading, as we’ll see in a moment. Orange is $20. Blue is $25, and both are offered together for five dollars less than their individual prices, $40. That would be great, if each of the first two levels actually had different channels: They DON’T. Blue has the new NBC and Fox channels, plus ALL of the channels of the Orange level, EXCEPT three: Disney, ESPN and ESPN2 are oddly missing from the higher Blue level. So the Orange + Blue option costs $15 dollars more than Blue for ONLY THREE additional channels: The Disney-owned properties that suspiciously disappear from The new, expanded Blue Package. 15 bucks for only 3 channels means that Disney is playing Hardball, and that Sling TV is complying. The only way that Disney will allow their flagship channels to sit along-side of Fox and NBC (or possibly streaming on multiple devices), is if Sling pays a premium, which they are passing along to the consumer. Wow. Isn’t that just like cable? This kind of advertising and “value” is exactly why people are cord-cutting, and Sling is rapidly becoming more of the same. Orange + Blue is 40 dollars a month for 46 separate channels. Sling’s parent company, Dish Network, offers a basic package of 190 channels for 50 dollars a month for the first two years. Cable providers tend to package basic-level HD channels with Internet AND phone for around 100. I realize that’s for a fixed period, and then prices go nuts (and you have to call to haggle with them), but the larger Sling becomes, the less it is looking like that big of a savings. Sling does offer more channels than the initial 46, but you have to pay 5 dollars for each additional “package” that you add-on to your monthly subscription (more for HBO and Showtime). These packages include other channels that you don’t want, just like your current cable company. There is no great difference, here. The promise is already starting to give way to reality: These media conglomerates are simply NOT going to play ball – they still want their piece of the pie, weather they are on cable, satellite, or a streaming device. To be fair, this is not Sling’s fault. It is the cancer that permeates the media companies. They refuse to cut the profit margins that they have enjoyed since the heyday of cable. They continue to squeeze the providers, who in turn squeeze us because we are dying to see this week’s episode of Big Bang Theory. Very few channels are actually independent entities; they are each a part of a larger corporate whole. NBC/Universal, for example, owns the Golf Channel, SyFy, Chiller, Cloo, E!, USA Network, Universal HD, Bravo, Esquire, Oxygen, Sprout and the Weather Channel. That’s not even a complete list. A company’s channels are picked up as a package by the broadcast provider that wants to present them – If they want NBC, then, generally, E!, Bravo, SyFy, etc. all come in under that package. Take into account that Comcast now owns NBC/Universal, and your head can really start to explode: How can you even begin to negotiate a cable alternative when these channels are banded together, and even owned by the big companies that you are trying to usurp? Throwing out your cable box. You simply will NOT be able to get everything that you want for a ridiculously low price. Many of us get our internet service from our cable provider, not to mention our telephone, so cutting the cable portion of the package kills their pricing deal, making the remaining two items more expensive. My only current thoughts for an alternative to a heavy-handed cable package is, unfortunately, playing their own game, and learning to live with less: Get a very basic starter package (bottom-tier cable with phone and internet), than add on one or two solo apps on a streaming player. A company like Netflix or HBO owns their own in-house programming, and doesn’t have to answer to the Cable company for broadcast. The only way to currently cut cost is to cut options, because the current “package” system that these multi-channeled companies are pushing on the consumer is over-priced and unwieldy, forcing you to pay for things you’ll never watch, just to get the things you DO want to watch. And as of this week, It looks like it’s going to be the exact same way with Sling TV. Get my (almost) daily journal entries delivered to your inbox! Won't that be fun? Thank you! There's a verification heading to your email. Nothing weird is done with your email address. Honest. I do nothing weird with your email address. Honest.